Multipurpose Tool Set Includes Essential Tools Conveniently Stored In A Durable, Molded Carrying Case. Carrying Case Stands Up For Easy Access To The Tools While You Work. Tool Set Includes Claw Hammer With Hardwood Handle, Tape Measure, Slip Joint Pliers, Long-Nose Pliers, Adjustable Wrench, Utility Knife, Torpedo Level, Screwdriver Set, Hex Key Set, Magnetic Bit Driver, Screwdriver Bits In Holders, Adapter And Sae Sockets In Holder..
Multipurpose Tool Set Includes Essential Tools Conveniently Stored In A Durable, Molded Carrying Case. Carrying Case Stands Up For Easy Access To The Tools While You Work. 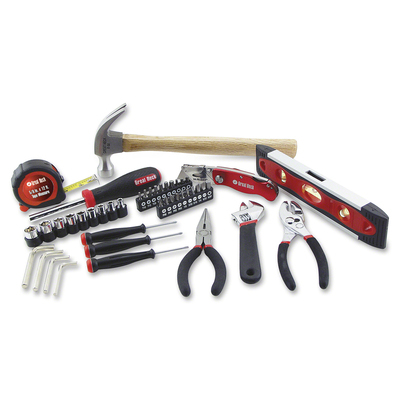 Tool Set Includes Claw Hammer With Hardwood Handle, Tape Measure, Slip Joint Pliers, Long-Nose Pliers, Adjustable Wrench, Utility Knife, Torpedo Level, Screwdriver Set, Hex Key Set, Magnetic Bit Driver, Screwdriver Bits In Holders, Adapter And Sae Sockets In Holder.